The Eparchy of St. Josaphat in Parma (USA) Held an Annual Conference for Its Clergy The clergy of the Ukrainian Catholic Eparchy of St. Josaphat in Parma held their annual conference on April 9-11, 2019 at the Loyola Retreat House in Clinton, Ohio (USA). Catechists, Religious, Clergy and Seminarians Attend Spring Catechetical Conference in Philadelphia Archeparchy Philadelphia, Pa.—Almost 100 catechists, religious, clergy and seminarians from the Philadelphia Archeparchy participated in the Spring Catechetical Conference held here Saturday, March 30, 2019. 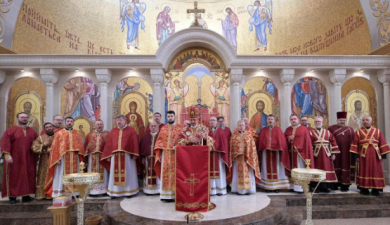 Bishop Bohdan Danylo Ordained Sviatoslav Ditchuk to the Order of Deacon On March 17, 2019 Bishop Bohdan Danylo Ordained Sviatoslav Ditchuk to the Order of Deacon at Pokrova Ukrainian Catholic Church. This wonderful event was witness by the parish community and guests of the parish, clergy and Deacon Ditchuk’s spouse. Bishop Bohdan Dziurakh participates in the solemn assembly of the Polish Bishops' Conference on the occasion of its centennial The 382th Plenary Meeting of the Polish Episcopate Conference, dedicated to the centennial of the Bishops' Conference and the restoration of diplomatic relations between Poland and the Apostolic Capital, continues in the capital of neighboring Poland, Warsaw. Desire for Unity: View of the UGCC on Dialogue with our Orthodox Brothers Below, is a translation of a text sharing the views of the Head of the UGCC Commission on Ecumenical and Interreligious Affairs, Rev. Ihor Shaban,on the topic of the dialogue with our Orthodox Brothers.